The Flashlight Seach Marketing Team at Rocktime would like to share with you their top ten mobile marketing resolutions for the New Year. Need any help setting up yours? 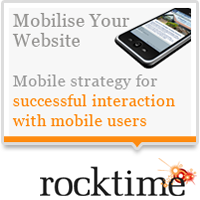 Then feel free to get in touch with Rocktime Sales to arrange a meeting. Why not head over to Mashable to take part in their poll to find out 'how others plan to change their life this year in the world of gadgetry and technology': Tech-Related Resolutions Poll at Mashable.